There was a time in England where it was illegal to be Christian. Alban was not Christian, but he thought the government was wrongs. So, he allowed a priest to hide in his house. The priest loved Jesus so much, Alban became a Christian himself. When soldiers came to search Alban's home, he gave the priest his own clothing and put on the priest’s robes, because he wanted the priest to be free to teach other people about Jesus. The judge found out what Alban had done and threatened to have him killed unless he worshiped idols. 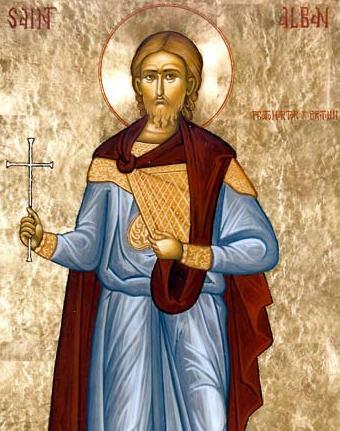 Alban refused and he became the first martyr of England. Jesus said there was no greater love than to lay down your life for somebody else. That’s what Saint Alban did when he traded his clothes with the priest so the priest could get away. Gather up some action figures, dolls or stuffed animals that have clothing and play Saint Alban’s Hide-and-Seek. One child hides his or her eyes, while the other(s) switch the clothing on two toys and sets them in a line. The first child has to guess which two characters have exchanged clothes. Then it’s somebody else’s turn. St. Alban, pray for us!